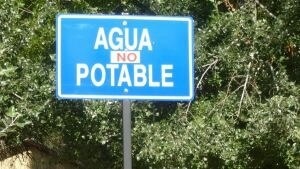 Possibilities to eliminate the issues relating to wastewater. Accessible fresh water in North Africa and the Middle East has fallen by two-thirds over the past 40 years, posing a huge challenge requiring “an urgent and massive response,” the head of the United Nations agriculture agency said today. Access to water is a fundamental need for food security, human health and agriculture, and sustainable water use for agriculture requires transforming food systems and diets, said Jose Graziano da Silva, the Director-General of the Food and Agriculture Organization (FAO), in a news release on his visit to Egypt. Per capita availability of fresh water in the region is now 10 times less than the world average, he said, underscoring the need for a significant overhaul of farming systems. A recent FAO study showed that higher temperatures may shorten growing seasons in the region by 18 days and reduce agricultural yields a further 27 per cent to 55 per cent less by the end of this century. The rising sea level in the Nile Delta is exposing Egypt to the danger of losing substantial parts of the most productive agriculture land due to salinization. The idea behind the research is not surprisingly new as it has been used as early as 500 B.C.E. when Aristotle deduced that salt can be removed from seawater using sunlight. This is why solar stills are still being used since the industrial revolution, but prove ineffective in producing a sufficient amount of water enough to sustain a person who wants to survive in the wilderness. Qiaoqiang Gan, the co-author of the study published in the journal Global Challenges, created a solar vapor generator and condensor. His method uses porous water with carbon black, a material that has near-zero “reflectivity” and can absorb an extremely large amount of solar heat. Gan’s team put a carbon-covered paper on top of a foam and a thermal insulator. This focuses heat onto the carbon layer, which is then placed on a dirty water source. Interestingly, the “paper” acts as a sponge, with the carbon as an evaporator. It is a known fact that majority of the world is covered with water. Unfortunately, most of that is not suitable for people to drink. According to Salon, if we exclude seawater, glaciers and ice caps, less than one percent of the planet’s water could be found in lakes, rivers, streams and aquifers. Even then, the water from these places still has to be treated to get rid of harmful chemicals. You have seen how Bear Grylls turns polluted water into drinking water with little more than plastic and sunlight. 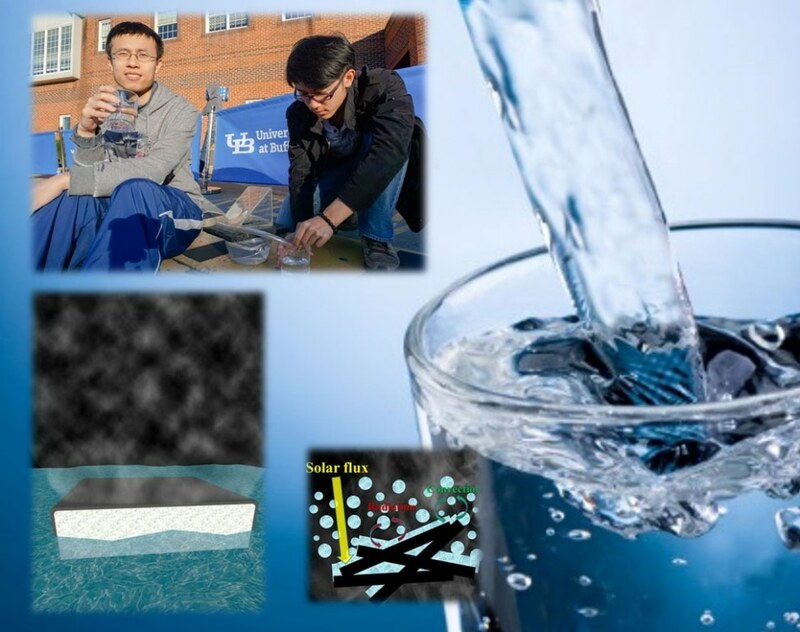 Based on this survival technique, academics have now added a third element – carbon-dipped paper – to create a highly efficient and inexpensive method to turn contaminated water and saltwater into potable water for personal use. Other members of the research team are from the University of Wisconsin-Madison, University at Buffalo‘s Department of Chemistry, Fudan University in China, and the lab of Gan, who is a member of UB’s New York State Center of Excellence in Materials Informatics and UB’s RENEW Institute, an interdisciplinary institute dedicated to solving complex environmental problems. Solar and nanoparticles and hydrogen, oh my! The promised hydrogen economy keeps getting pushed back farther into the future, it seems, as producing hydrogen sustainably and at a low cost is always just around the bend in time, and while hydrogen has its share of opponents, it also has its boosters, such as HyperSolar, which looks to bring a breakthrough to scalable renewable hydrogen production. Although this element is one of the most abundant in the universe, and the third most abundant on Earth, it’s also the lightest, which makes it rare in our atmosphere (meaning we can’t just hoover it up from the air). Hydrogen isn’t exactly known for its energy-density, but it is one potential storage solution for building a more sustainable energy system, if it can be produced efficiently with renewable energy, and then stored and distributed efficiently, as opposed to the current major source of hydrogen, which is steam-reformed natural gas. an electrolyzer, this prototype has its solar energy component directly submerged in the water, with its “Self-contained Photoelectrochemical Nanosystem” technology that is “designed to mimic photosynthesis.” According to the company, this nanoparticle-based system enables a much more efficient electrolysis process than one powered by a separate solar input, which would have higher losses of transmission between the sun and the actual hydrogen production, and it says its system could “significantly” lower the cost of hydrogen electrolysis. Did you know that over half of the drinking water in the United States and nearly two thirds of the drinking water in Canada comes from forests? In a recent study, the non-profit National Association of State Foresters (NASF) confirmed that the best management practices used by harvesting professionals and required by forest certification standards are paying off in maintaining the water quality in our forests that translates into the clean water coming out of our faucets.